Great strides have been made over the years to create real options for those with gluten intolerances. This is not an affliction I have although I have numerous friends who for various medical reasons cannot tolerate gluten. With that in mind, I like to taste gluten-free edibles at various food shows to see if there is an outstanding product for my friends. One of my favorites is Cup4Cup Pie Crust Mix that produces light and flaky pie dough. After I tasted the pie crust I was told it was gluten-free, I was truly surprised. The Cup4Cup Pie Crust Mix is one of the numerous gluten-free mixes developed by the chefs from the James Beard and Michelin award-winning restaurant, the French Laundry; multi-purpose flour, multigrain bread, fried chicken mix, muffin mix, cake mixes, cornbread, pizza crust, chocolate brownie and pancake. So is it easy to work with? 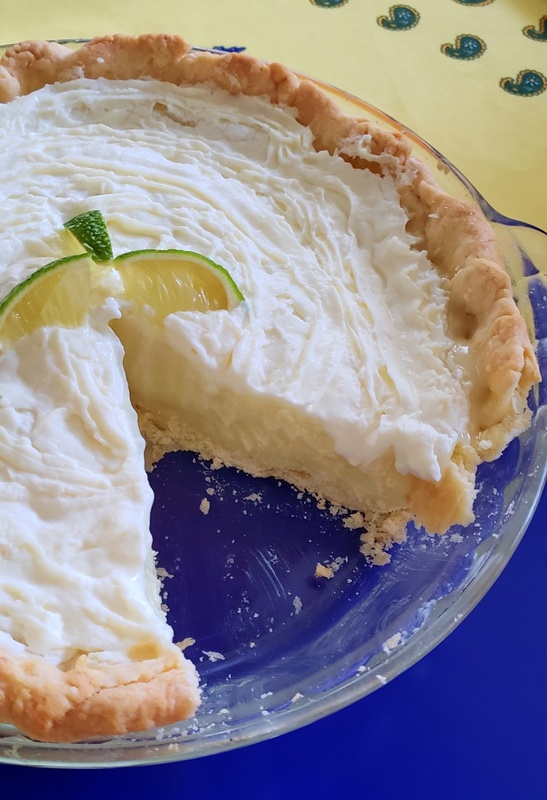 The website says “The Cup4Cup Pie Crust Mix makes it easy to prepare sweet or savory pies; tarts and quiche—just blend with butter, water and egg yolk. Any way you bake it, you’ll have a rich crust that’s so light and flaky, you and your family won’t believe it’s gluten-free.” So I thought I would put it to the test. The one pound package of Cup4Cup pie dough will yield one double-crust pie or two single-crust pies fitting a 9 inch pie pan. I am not the best pie maker but I wanted to give it a try. Following the instructions to the letter, I added 8 ounces of ice cold, cubed butter until crumbly, then1 large egg yolk and 10 tablespoons of ice water and blended until all started to stick together when pinched. Since I have a scale I measure out the finished dough into 2 equal weighing discs, wrapped in plastic wrap and chilled for about six hours, even though I could have moved forward after an hour of refrigeration. That night I proceeded and took the dough out of the refrigerator and waited the instructed 15 minutes before rolling it out. I had sufficient dough for a single pie crust in the one disc of dough and it was a little crumbly while I rolled it out but I pinched the dough together. Now, as for instructions on baking the pie dough, they tell you to follow the instruction on your pie recipe. 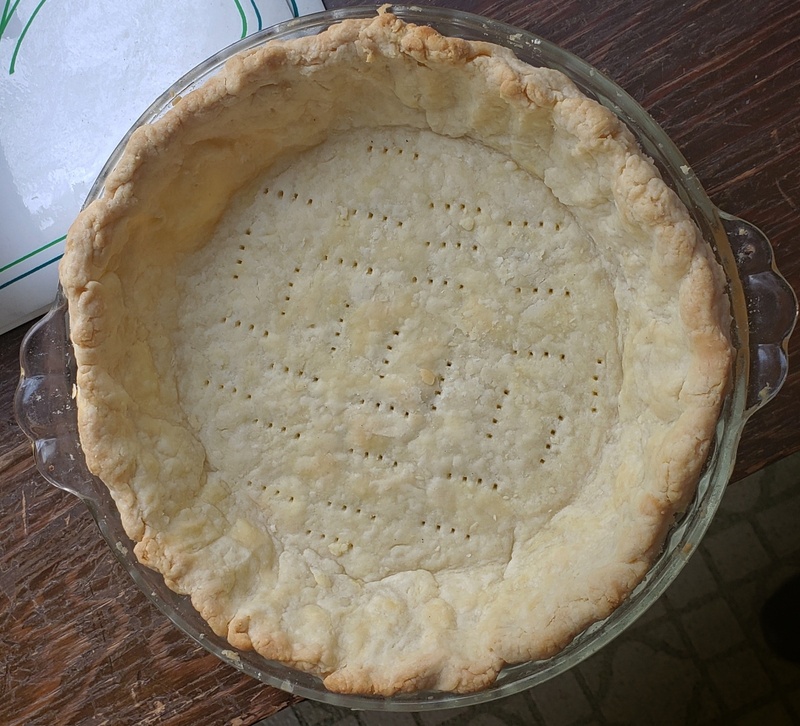 I had some canned pie filling so I blind baked the pie dough at 375 degrees for 20 minutes, removed the parchment paper and dried beans and pricked the pie crust with a fork so it would eliminate shrinking and a crisper bottom. It remained in the oven for 10 minutes more. Since ovens vary, I suggest you keep an eye on it during the blind bake. The pie crust was flaky as it had been the time I tried it at the food show. I chilled the pie overnight with whipped cream and the pie dough remained crisp and flaky. The pie filling was not very good but the crust remained outstanding.